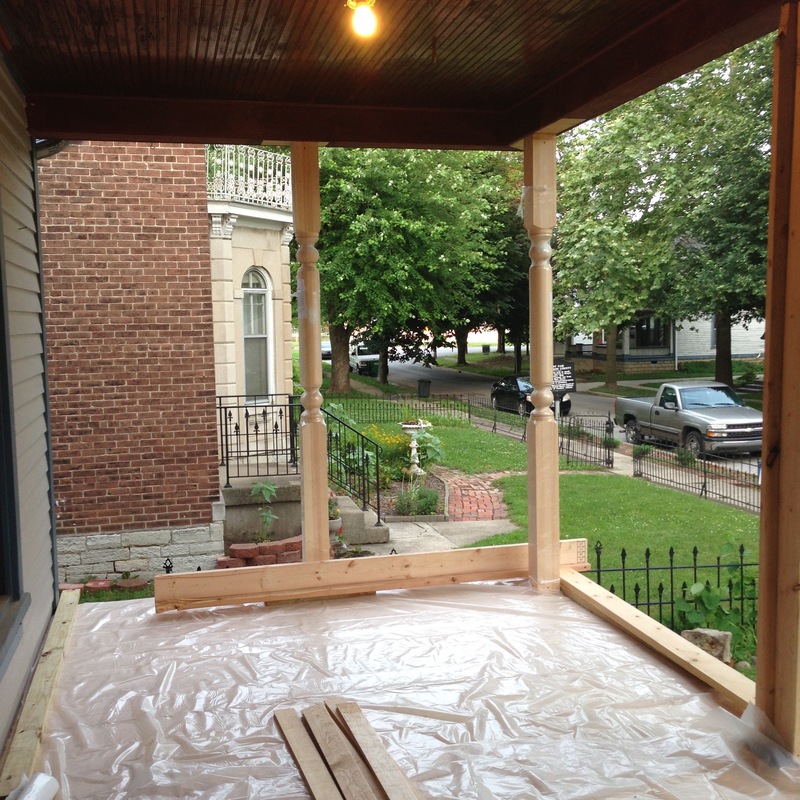 The porch is coming along nicely, except that it felt like it started raining at noon every day for two weeks, which made things go slower than I would like. But it’s looking great! 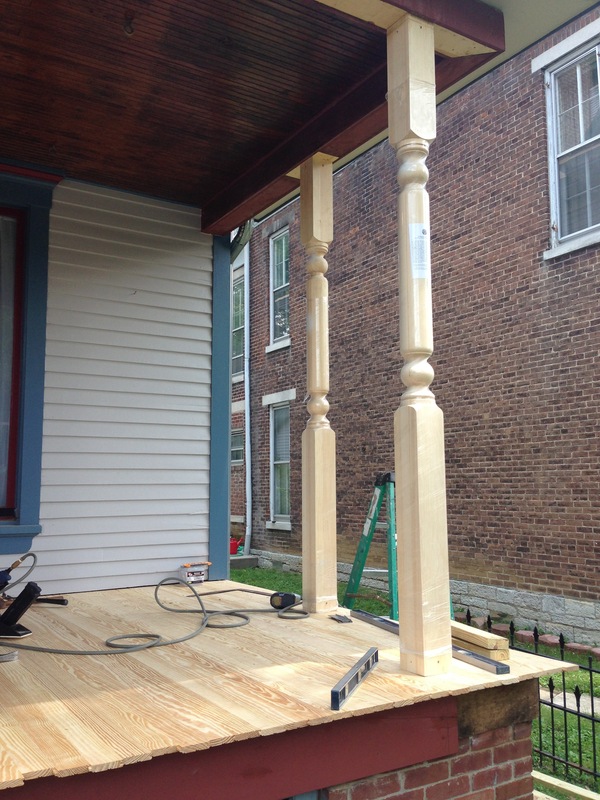 The porch posts got moved in one by one as the floor worked its way across. 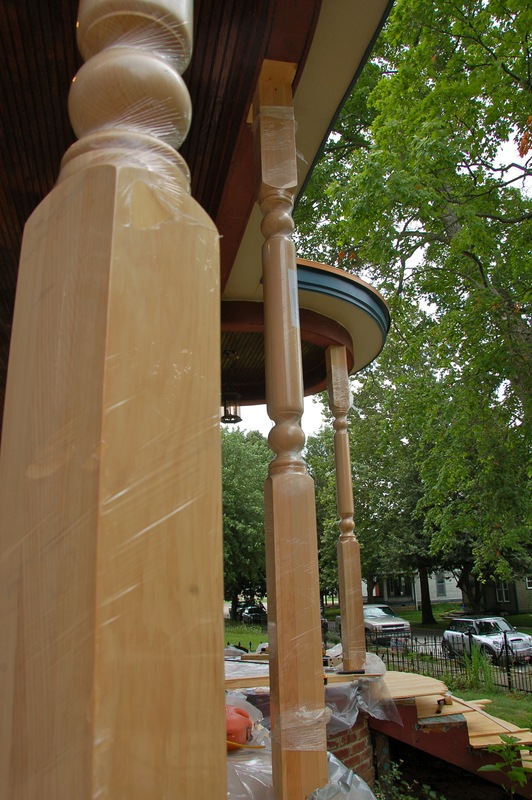 It’s funny how gigantic and chunky the porch posts looked when they came out of the shipping container, but once they were on the house, they look like toothpicks. 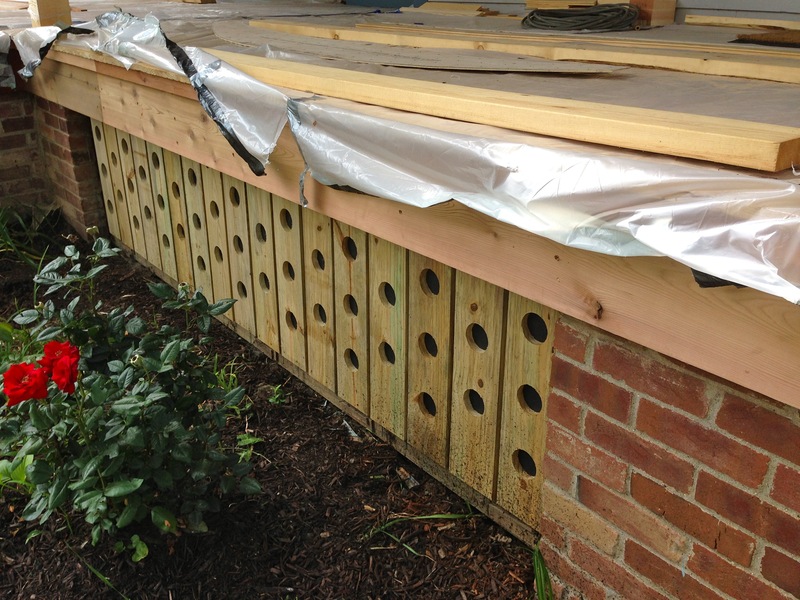 But they are beautiful, and are quite similar to the original posts from when the house was built. 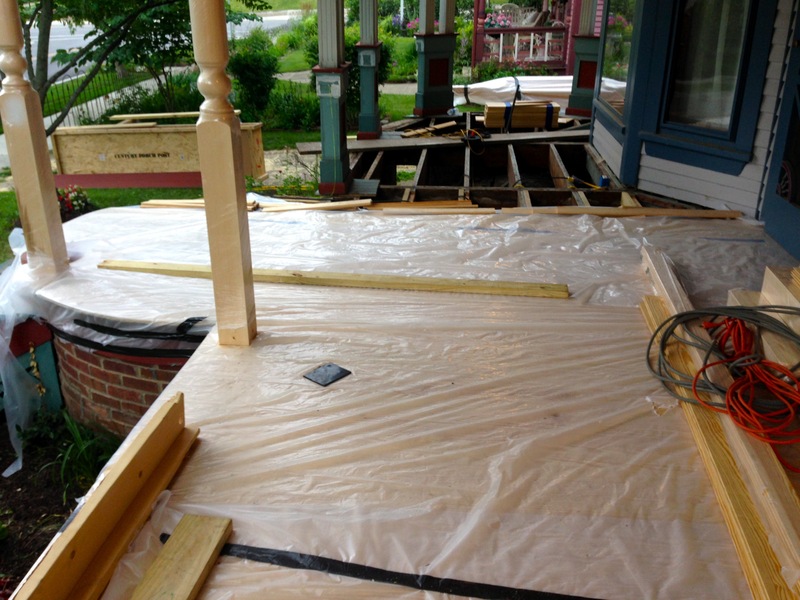 The floor worked its way across the porch, and each day had to be covered with plastic (because it rained EVERY DAY…. grrrr…..). 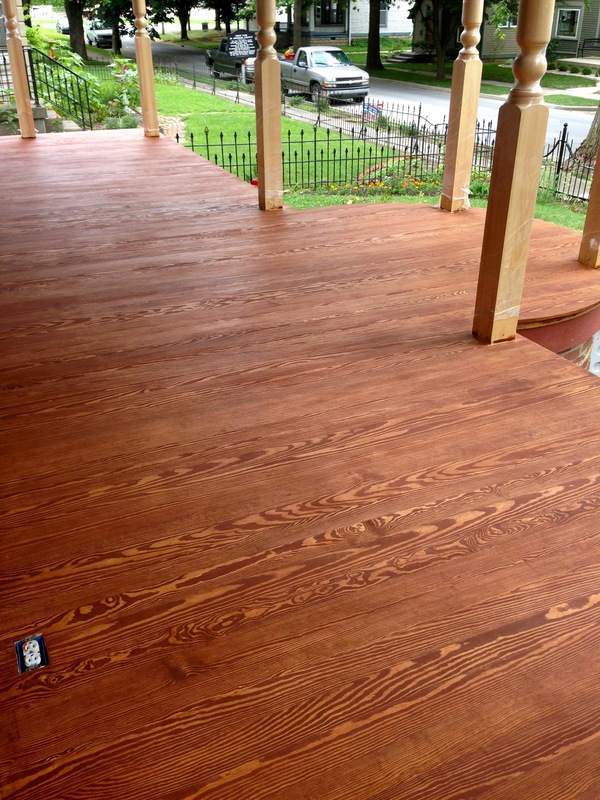 We chose a very typical porch floor for the house : tongue and groove 3″ pine. It’s laid just like a hardwood interior floor. This look is very victorian, but does come with issues. 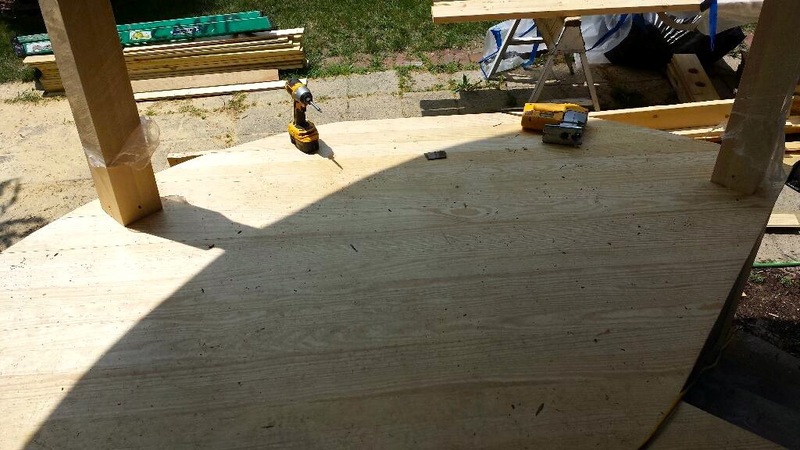 Since the floor is laid like a floor, and not a deck with spaces in between, water might continue to be an issue since it’s can’t escape through cracks. 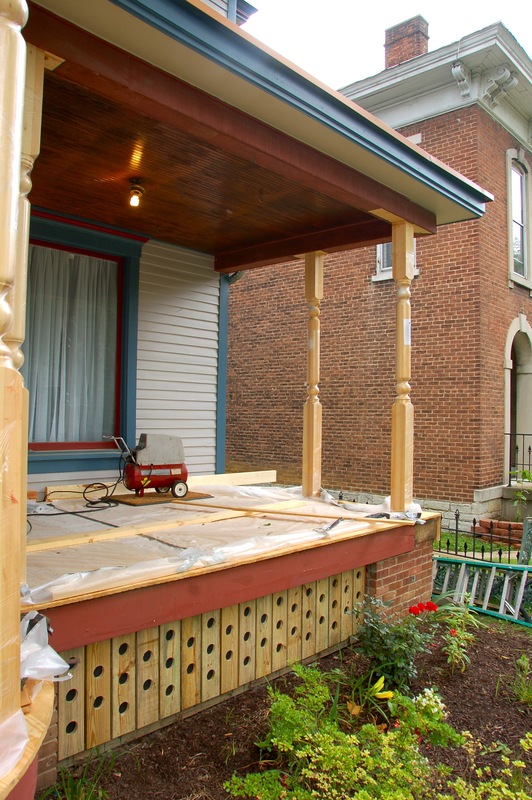 That’s why so many old houses have major rot issues with porches. We love the look, though, and hope that the sealant (and our own vigilance, especially in the winter) will help us keep the floor for a long time. 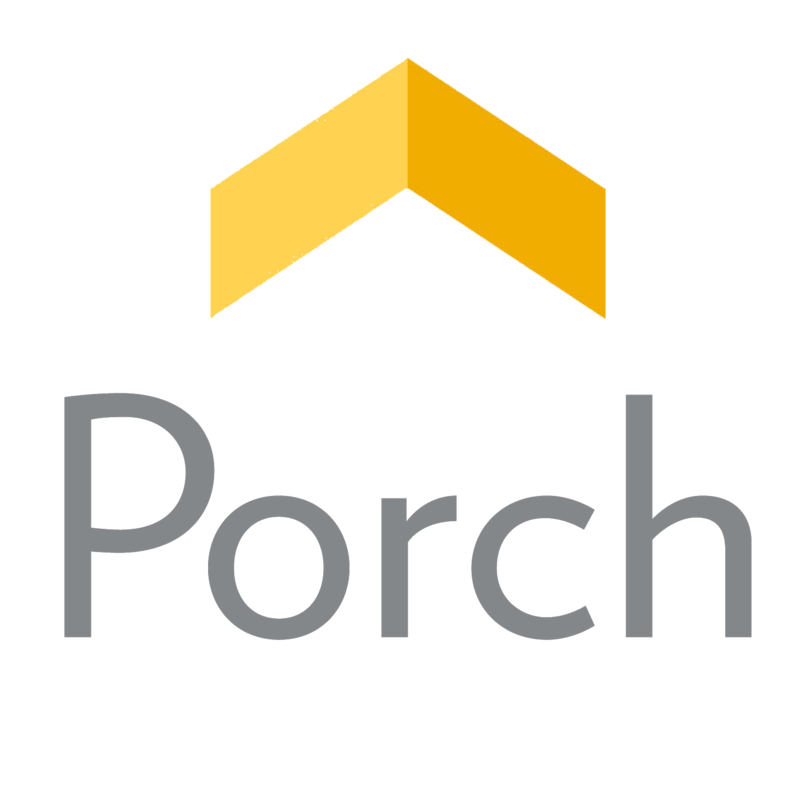 All the porch posts are up!!! 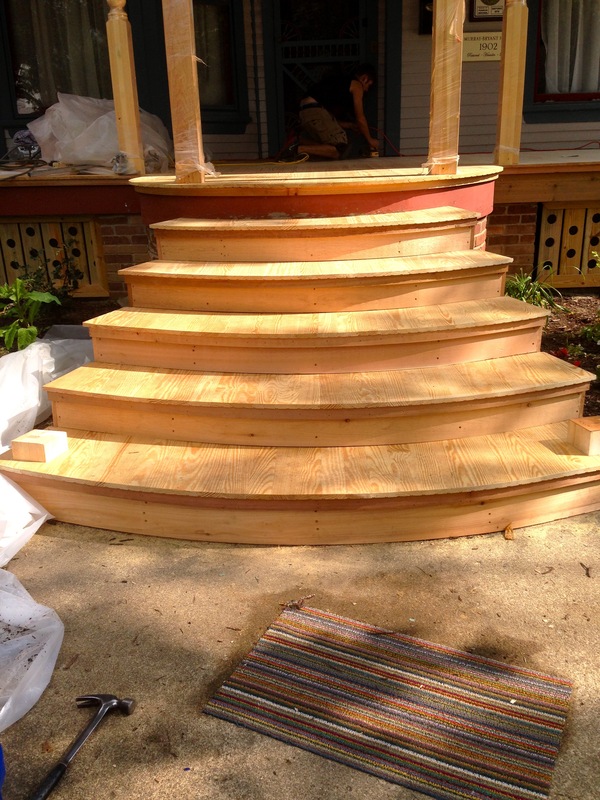 Last look at the old steps…. ….because now they are being rebuilt! 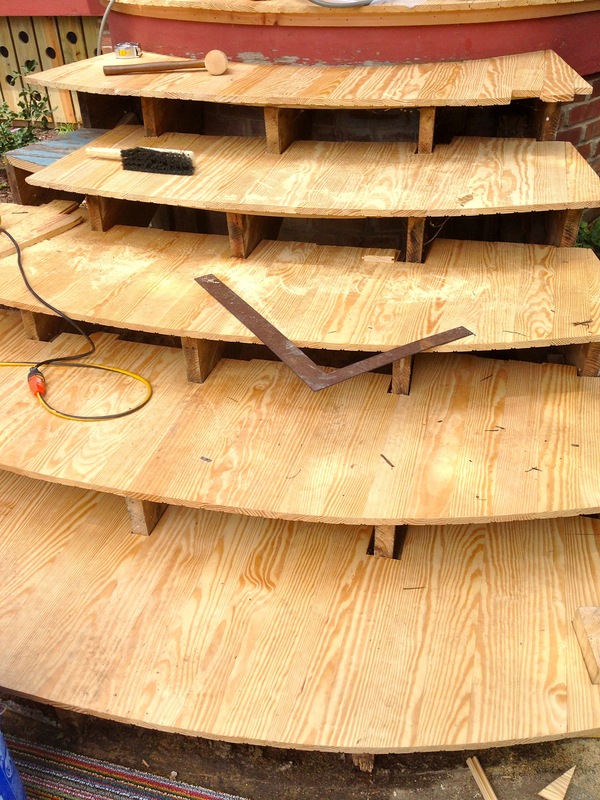 The risers were removed, but the steps themselves were in decent shape (just completely ugly). 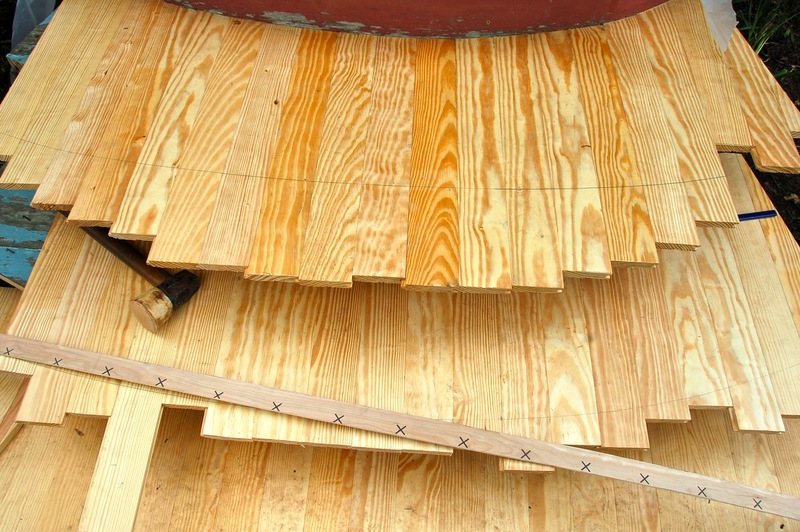 We chose to continue the flooring onto the steps, and used the cut-offs from the porch to do so. 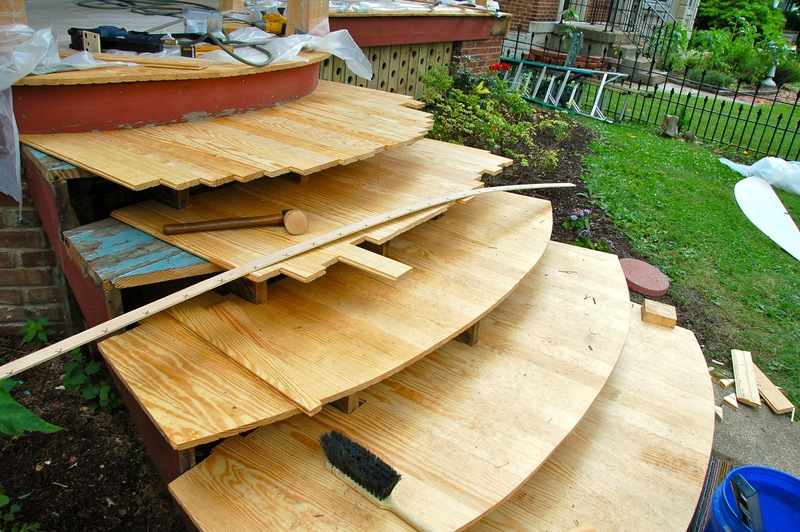 The guys laid the flooring across the steps, then came back and drew the curve, and used a jigsaw to make the treads curved. 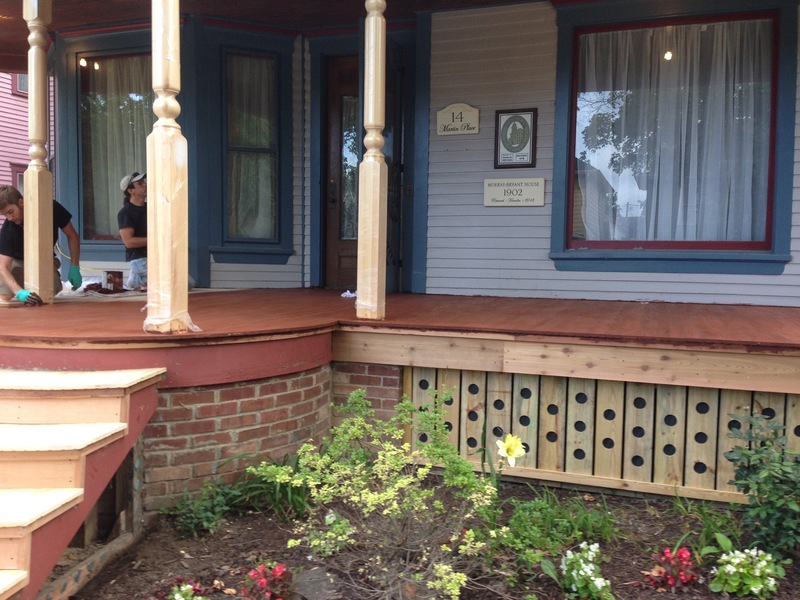 Meanwhile, the porch skirts are all on, and Cody, our painter, REALLY wanted the circles solid, because he wanted to paint them purple. I’m on board, but it involved some modifications. We decided – for the sake of keeping it cheap and easy – to staple screening to the back of the boards, because the paint will collect on that. 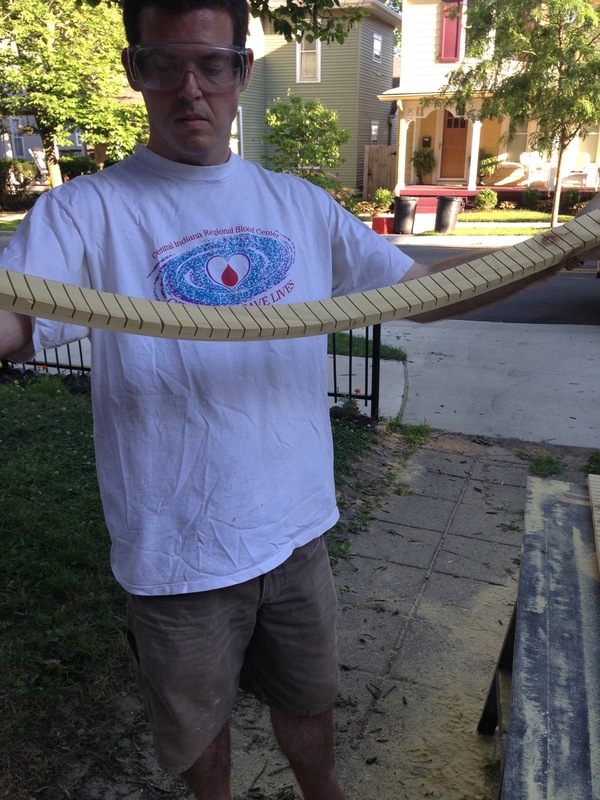 You can’t see it well here, but the screening is in, ready to be primed. The flooring is completely finished, finished off with the tiniest sliver of curve at the end! All we need now are the step risers, and then we move onto finishing work! 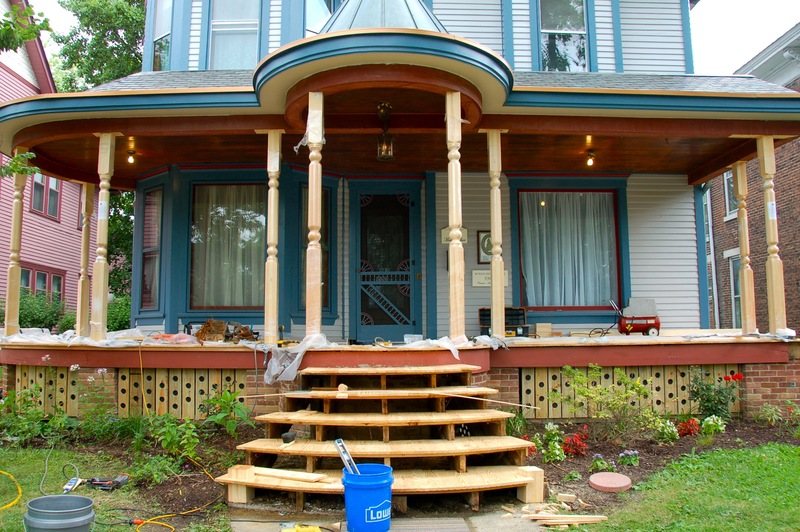 Once the risers were added, the porch REALLY started to look complete. 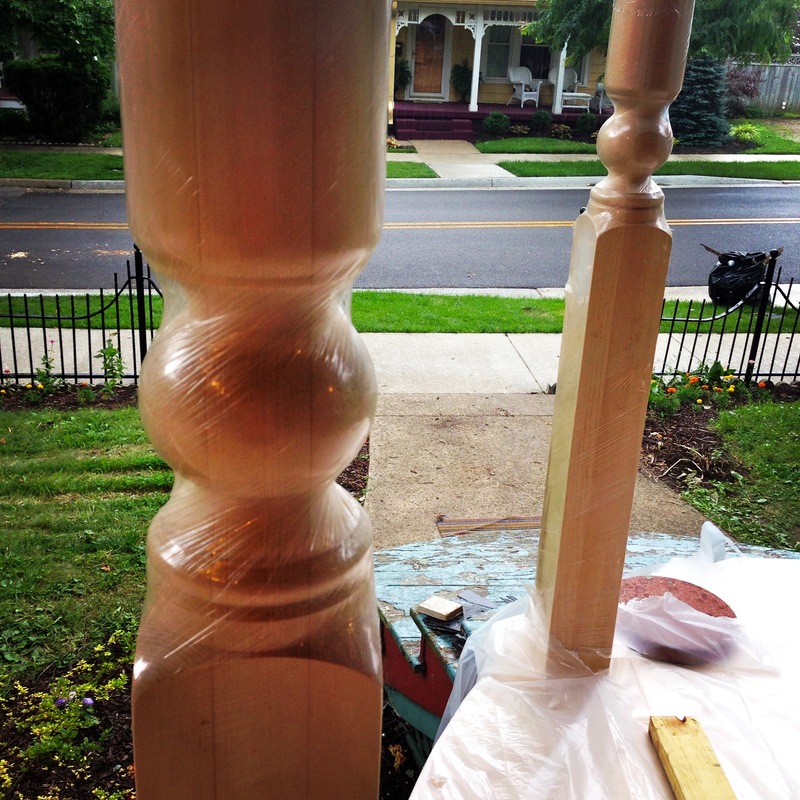 And, just kidding about the build being done : Doug accidentally ordered the wrong height newel posts – they were too short. So, we sent them back. 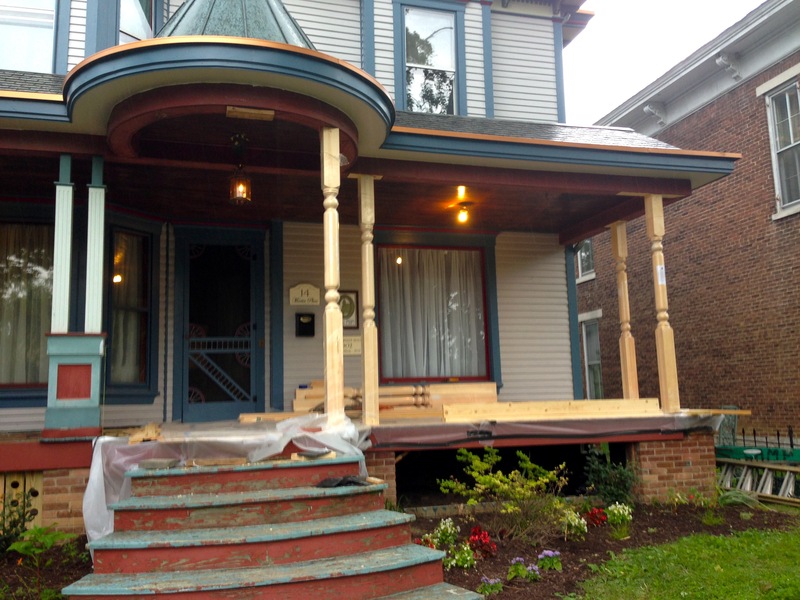 The new ones will be installed with a railing – even though the porch originally didn’t have a railing, we are choosing to add one on the steps for safety. 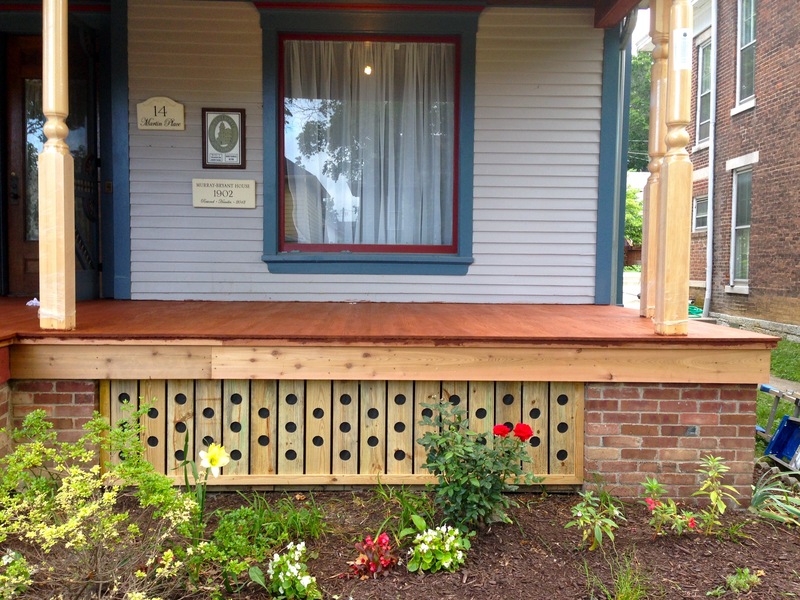 We are NOT going to have a railing on the rest of the porch right now – sometimes you just run out of money. Maybe we’ll keep it open. We’re not totally sure yet. 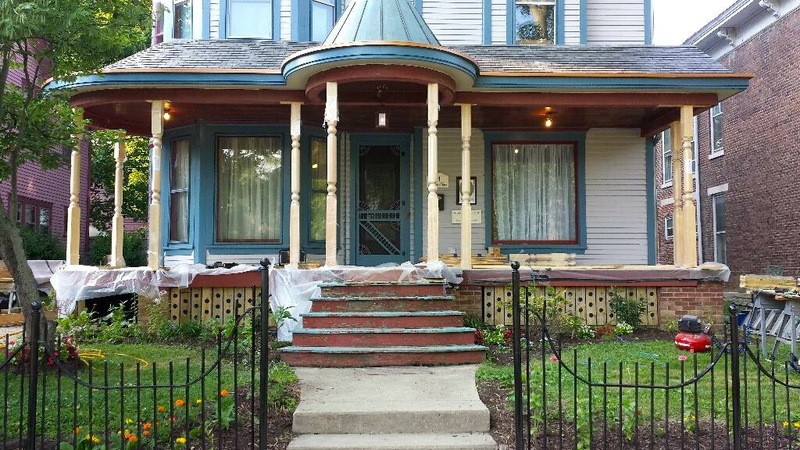 Just please don’t fall off the porch. But if you do, you’ll probably just break an ankle. 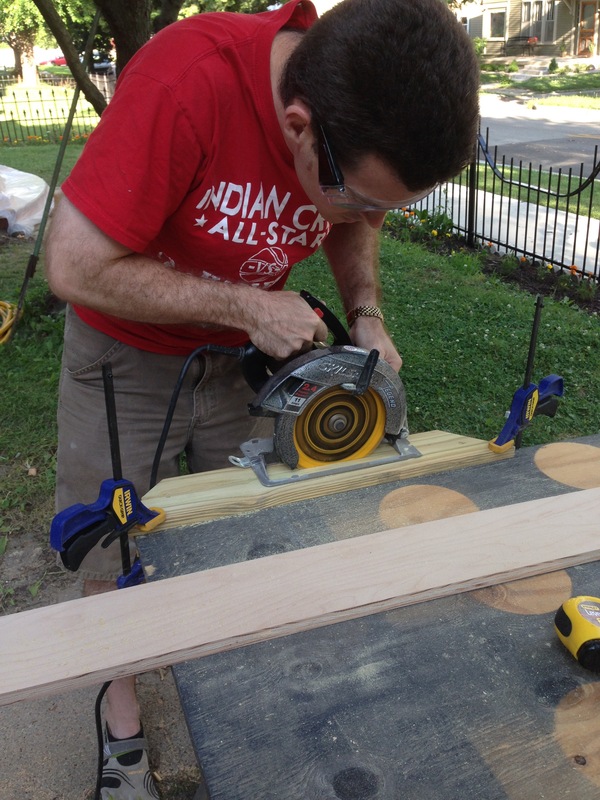 We started building the frames for the porch skirt – and when we thought they were too thick, we cut them down further. 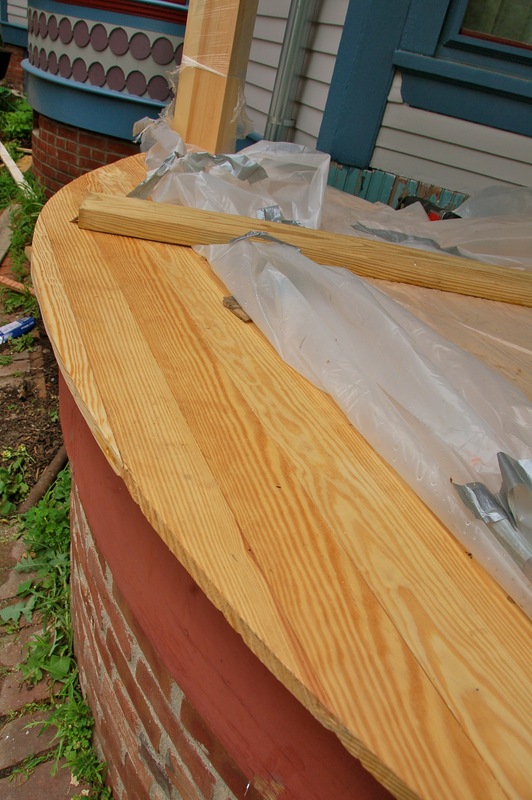 For the curved side of the porch, Doug used the circular saw to cut oodles (“oodles” is an industry term) of small cuts along the backside of the board, which makes it bendy. 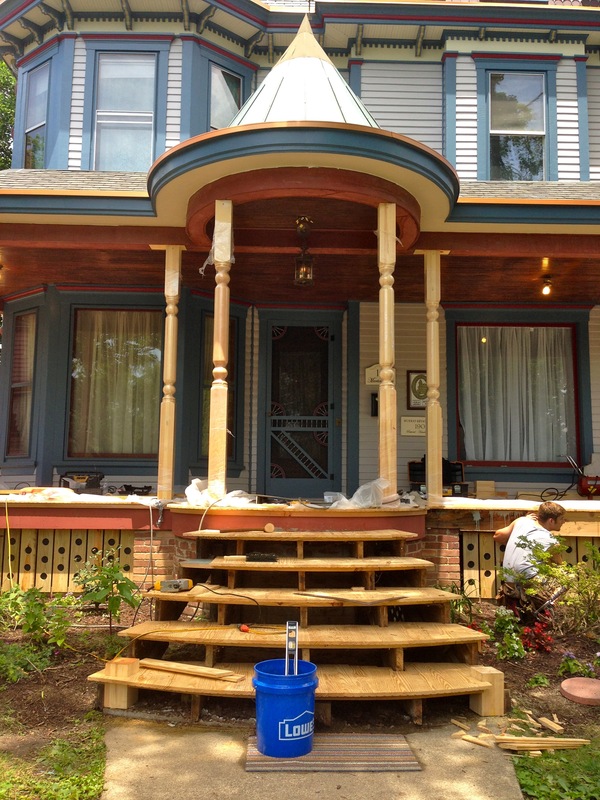 Now that the build (except the railing) is done, the fun begins : finish work. 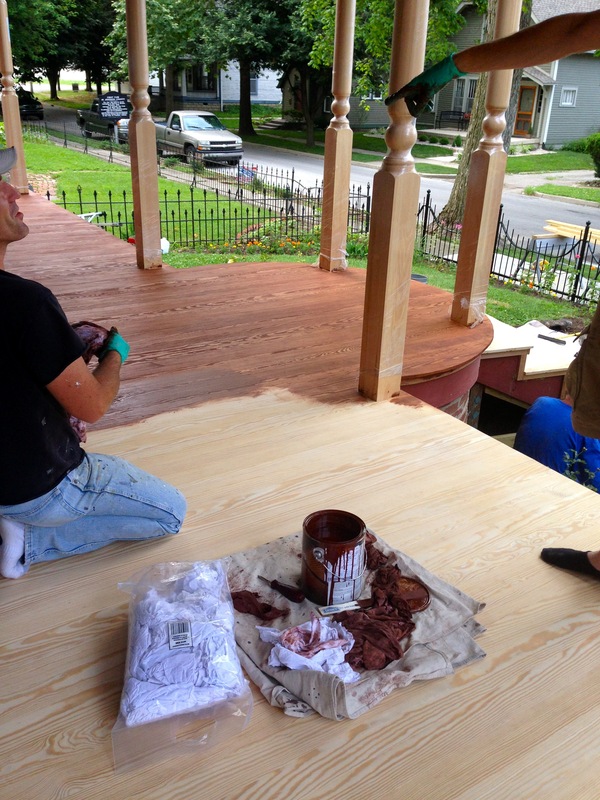 First coat of stain is going on, and it looks great. 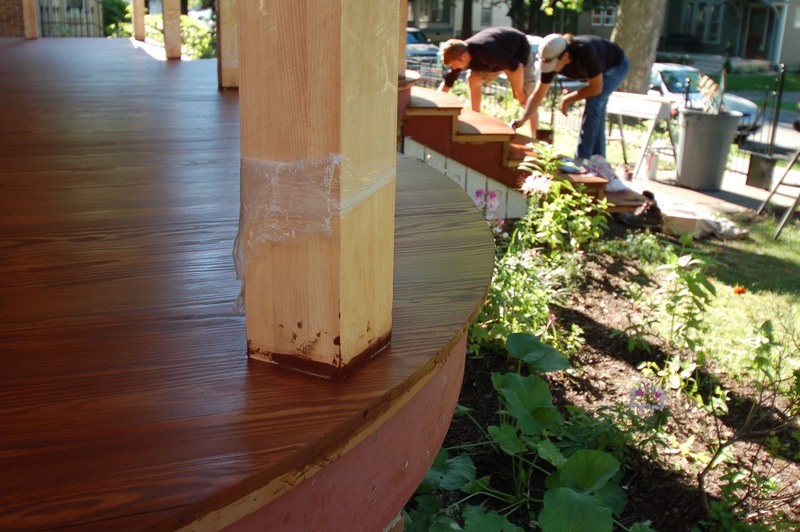 We opted to stain instead of paint. Hopefully we can keep on top of it and it can last for a while. You can’t go from paint to stain, but you CAN go from stain to paint. 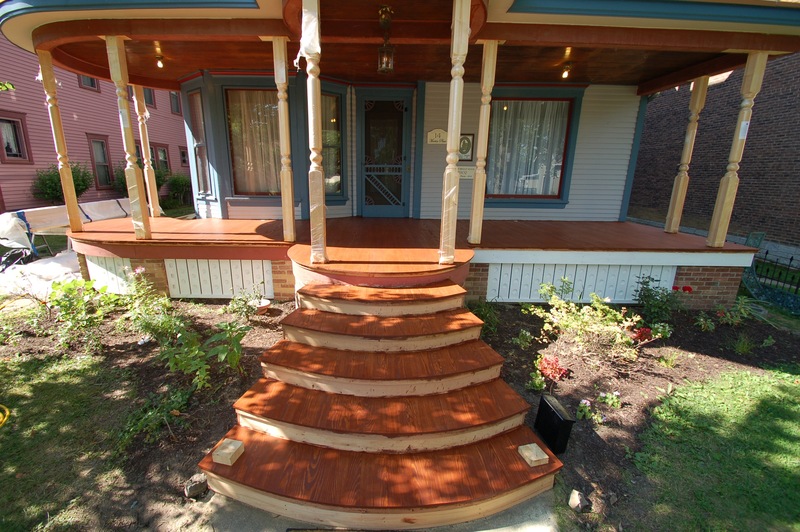 I’m worried about the steps making it through a winter, but hopefully I’ll be surprised. If we have to paint in a year or two, we will. 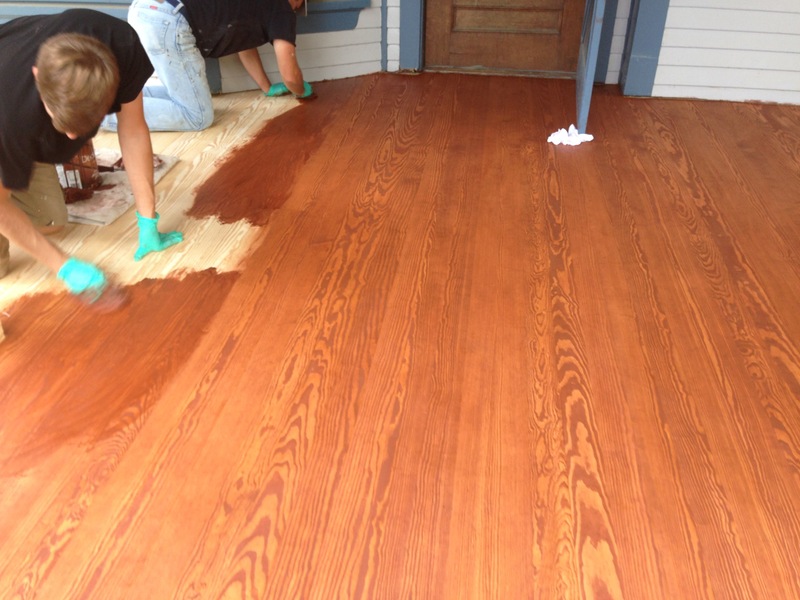 The color just got richer and deeper with the second coat. And I felt a lot better now that it’s waterproof. Oh, and some priming happened! Almost since the day we put an offer in on the house, I have had a vision in my head for what each room and the outside looks like. It’s so fun to watch it become the vision that I’ve had for so long. Here’s where we are now!!! A lovely story : yesterday, I was out fabric shopping, and Doug called me. He had come downstairs, and noticed people taking pictures of the house. He went outside and talked with them. 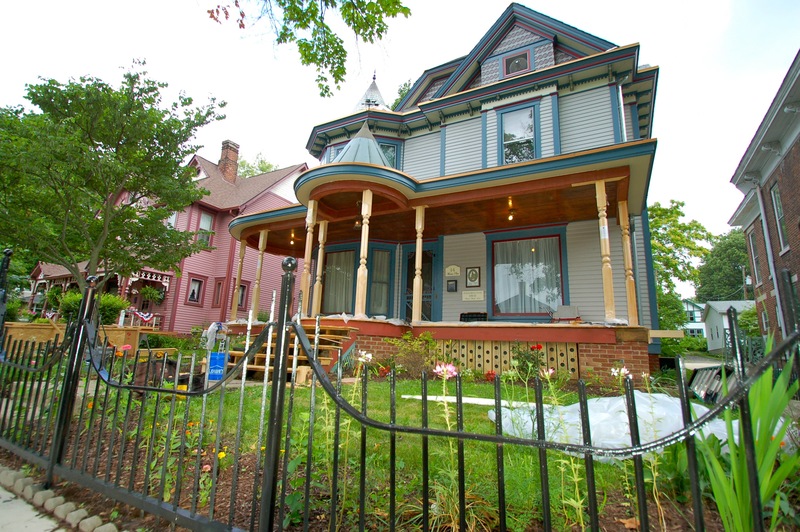 Their mother owned the house back in the early 2000s – she and her husband had always wanted a Victorian, and this was their dream house. They bought it, loved it, spent time on it, and sadly, her husband passed away. The house was too big, and without her husband, unfortunately she lost the house. Though she moved to the south, she never stopped loving this house, or missing it. When she was in town, she would just park in front of it, and cry because it had fallen into such disrepair. Her children were in town, and drove by, and when they saw that someone had fixed it and was loving it, they started taking pictures for their mom, because they knew it would make her so happy. 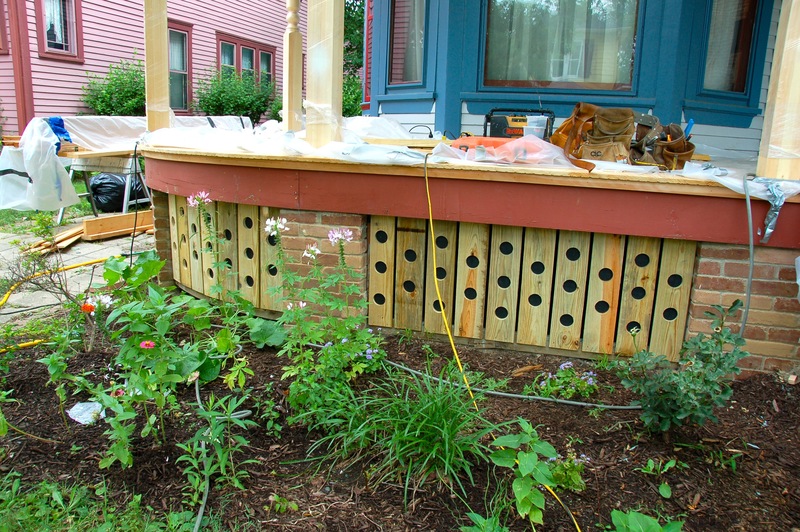 They saw the old arbor sitting in the yard, and asked about it. They asked to buy it – because their mom would love to have it. Next PostEight New Projects. Happy 4th of July! I love everything about this. The tongue and groove porch floor especially. 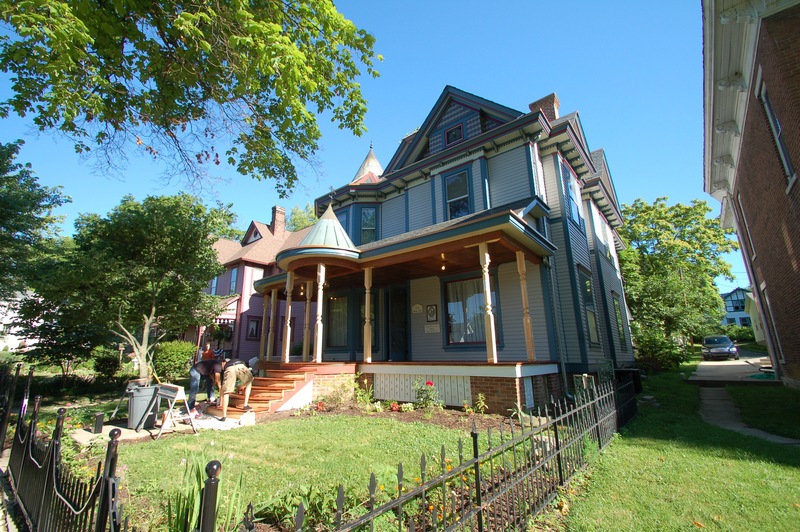 And the story about the previous owners is really sweet. 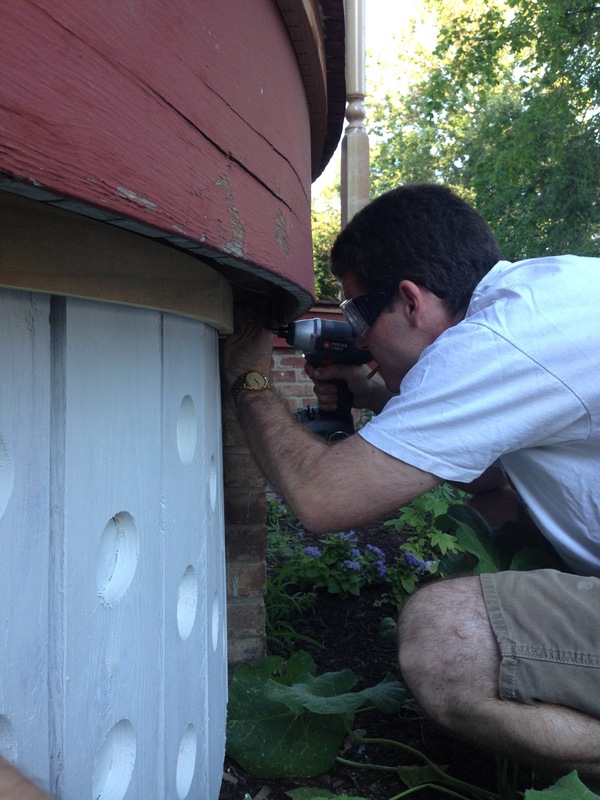 There’s still enough air circulation under your porch with the holes screened and painted over, right? Yup! 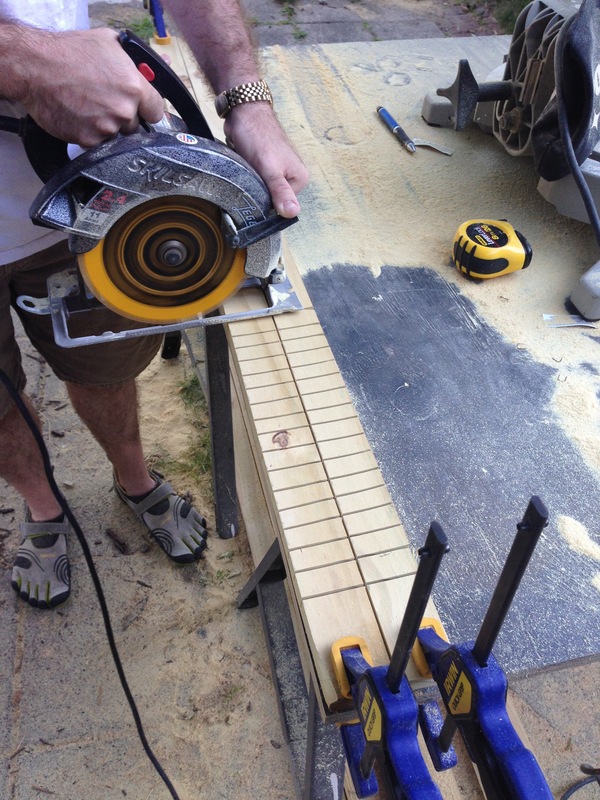 There is a half-inch gap between each board, which will be plenty. 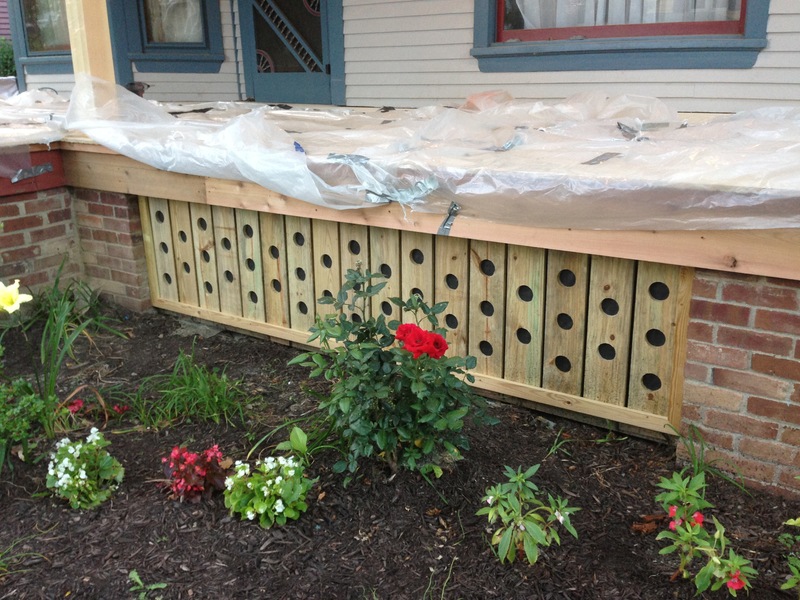 And one of the panels is done in such a way that the entire thing comes unscrewed, if we want to store anything under the porch or get underneath for any reason. oh and I just noticed that you have an outlet. I’m super jealous. One on each side, actually! 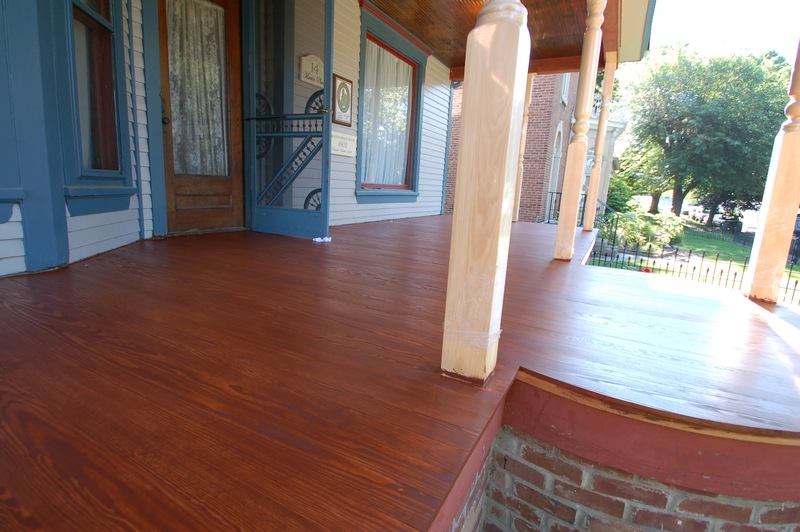 Doug actually had massive plans to add more on the extreme far ends for Halloween / Christmas lighting, but the porch flooring moved so fast it didn’t happen. I’m sure it will, someday! “This makes me smile.” And obviously, Amy, your house is smiling right back at you! The plan : Save all the plaster that we could (which was just 2.5 walls - the rest was already drywall), raise the dropped ceiling in the kitchen to match the rest of floor 1, take the wallpaper down, and move the wall between the Butlers pantry and the kitchen, to make the kitchen about 18” bigger, and the Butler’s Pantry about 18” narrower. 2012. 🏡 #Latergram Project : Kitchen and Butler’s Pantry! While I’m planning the library, I’ll take you back in time so you can see exactly what we walked into! The pre-Instagram work (exterior, kitchen, laundry room, and some misc elsewhere!). Next project on the “Things we did before Instagram” Latergram Project is the Kitchen and Butlers Pantry. Here are the Before pictures! There was almost no counterspace. The current butlers Pantry was the kitchen from the 80s remodel (pics 1-5) - but no appliances, and almost no storage, and about two feet of counterspace. The “Breakfast Nook” became our kitchen (pics 6-9). It had nothing in it, except one lonely sconce and a random cabinet - it was just a long bowling alley of space. Here is the Before! 🏡 #Latergram Project : While I’m planning the library, I’ll take you back in time so you can see exactly what we walked into! The pre-Instagram work (exterior, kitchen, laundry room, and some misc elsewhere!). You guys. There’s a CHURCH FOR SALE in my town. 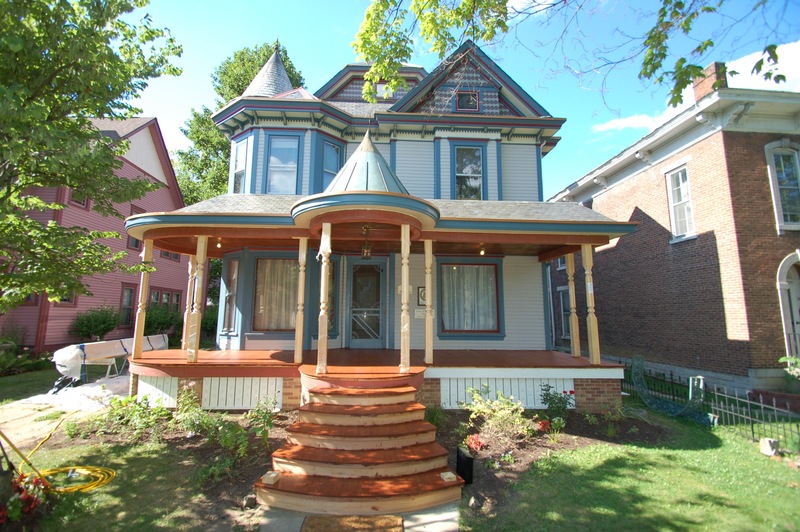 First pic is mine, the rest are off the realtor page. $450K. Someone come save this and make it amazing! All the sunshine. All the blooming. I love “Wildcard” week on #52weeksofhome - there are so many creative and out-of-the box pictures that are super cool. I especially loved the historical posts that some of of you had this week! Here are some of the favorites from this week - I have everyone is having a lovely weekend! #52weeksofhomeweek16 🏡 Next week’s theme is “Seating” Benches, inglenooks, couches, chaises, chairs..... anywhere you sit! 🏡 Want to jump into the photo challenge? Jump in this week, or start at the beginning (or any other week). You can find a complete list in my feed, but I’ll also post the current and upcoming here - just swipe. It’s just for fun - a grown-up (or not) version of show-and-tell! 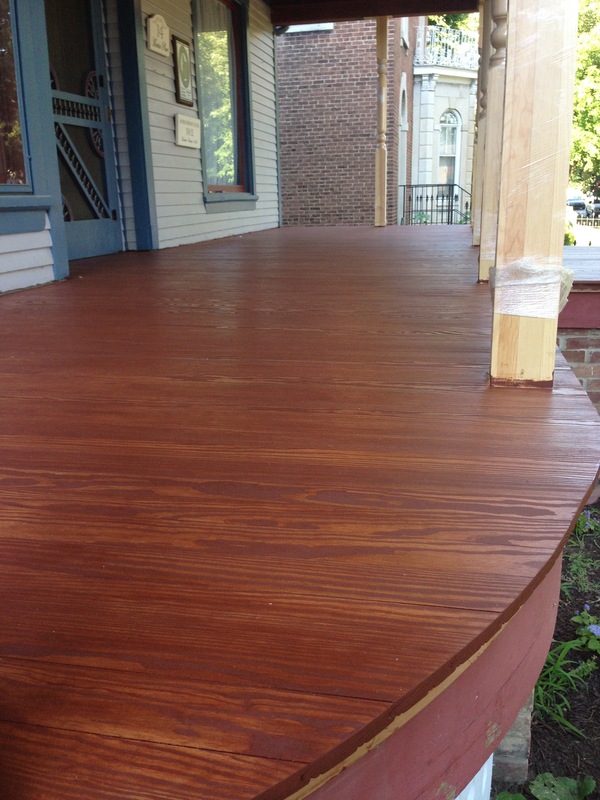 Check out the hashtags for more pictures from some amazing homeowners. Seeing the outside finished was so incredibly amazing. There’s such a huge journey to go inside, but having the exterior done put our mindset in such a better place. ❤️ Since the porch and exterior is done in my Latergram Project, I’ll finish up the show and tell with several “Afters and Befores” over a few posts! Picture One & Two (2014), Picture Three (2012). 🏡 #Latergram Project : While I’m planning the library, I’ll take you back in time so you can see exactly what we walked into! The pre-Instagram work (exterior, kitchen, laundry room, and some misc elsewhere! ).